The Dow Company's Nick Scheib, Commercial Market Manager, recently told us that one of the best ways Dow gets new product ideas is to watch where things are being done inefficiently at a construction site. Inefficiency, Nick says, can suggest the need for a new product. Dow’s building material scientists and marketing managers are always looking for new solutions to construction challenges. One recent challenge they solved was for an easy way to flash and seal surfaces, to provide a long-lasting protective barrier. We are pleased to have assisted Dow’s research by having their new sealant field tested on the new Aurora Public Library. Field taping of joints, gaps, and around penetrations, Dow determined, is labor intensive and inefficient. It is also often ineffective, especially where joints are unlevel or uneneven, or when tape is poorly adhered or cut. 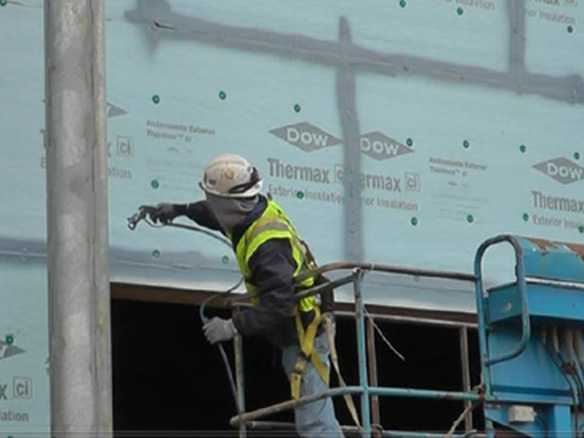 Since air leakage in buildings is responsible for about 4% of the energy they consume in the United States, Dow reasoned there would be tremendous benefit from a product that provides superior air leakage and moisture control, with easier application than conventional tape. Since Dow’s scientists are world experts in advanced chemistry, they soon focused on an elastomeric product to create an innovative and better liquid flashing alternative. Dow’s "LiquidArmor" was designed as a time-saving alternative that is about four times faster to install than flashing tape. It can be spray or brush applied, and serves as both joint sealant and window flashing to provide advanced moisture and air sealing. Applied as a liquid, is sets as a flexible elastomeric solid that forms a tight, durable, seamless barrier along joints and rough openings, and around screws, veneer anchors, penetrating fasteners, and hard-to-reach gaps up to a quarter-inch wide. It is water-based, which reduces cleaning time, and has low VOC emissions. According to Dow, the product is non-hazardous and can be applied without a respirator or extra ventilation. 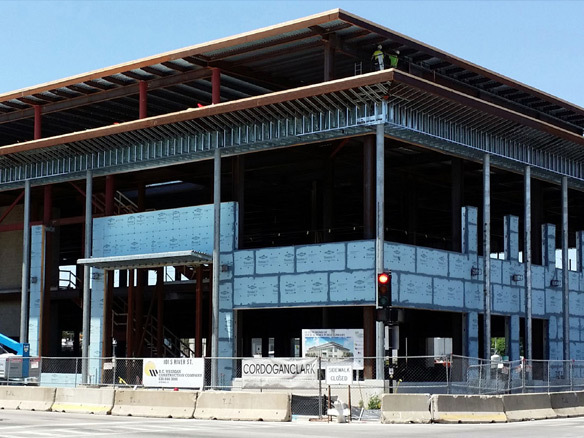 Cordogan Clark & Associates worked with the Dow company in testing their product on the new Aurora Public Library. The 93,000 SF public library, given the building’s size and variety of conditions, provided an excellent test case. We joined Dow material scientists in New York last week to receive their 2016 Gold Edison Award in the Energy and Sustainability category for LIQUIDARMOR™ - CM, for which it was selected from hundreds of finalists. The Edison Awards culminate an annual, international competition designed to honor excellence in new product and service design and innovation. The Edison Awards namesake, Thomas Alva Edison (1847-1931), was an American-born inventor and businessman, who over the course of his life was awarded a staggering 1,093 U.S. patents, including ones for such landmark inventions as the electric light bulb and phonograph. "This Edison Award," said A.N. Sreeram, senior vice president and chief technology officer for Dow, "is evidence that our world-class team of scientists and engineers around the world continue to fuel our innovation pipeline with solutions like LIQUIDARMOR CM Flashing and Sealant – bringing sustainable and high performing solutions that meet customer needs." Jane Palmieri, Dow Building & Construction business president added, "LIQUIDARMOR is the result of tremendous collaboration by our Construction Chemicals and Building Solutions businesses, combining the right chemistry with the right channel to market, resulting in a high performance, time-saving solution for our customers."